My recent article on Les Orientales, a multi-cultural music festival that understands the difference between art and entertainment, attracted a lot of interest. I promised to return to Les Orientales with further posts, and today I am looking at recordings of music from Saint-Florent-le-Vieil. 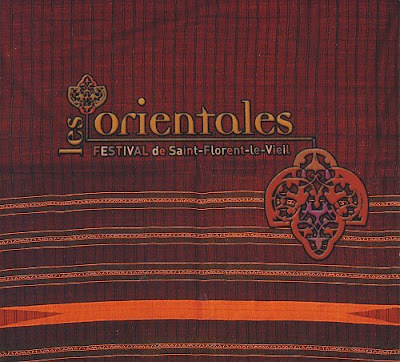 The bad news is that the Les Orientales CD only appears to be available at the Festival, which is where I bought it. But the very good news is that French radio station Jet FM, which bills itself as La radio curieuse - we need more stations like that, currently has MP3 downloads of concerts from this year's festival. These downloads deliver twenty hours of Petroc Trelawny-free music. 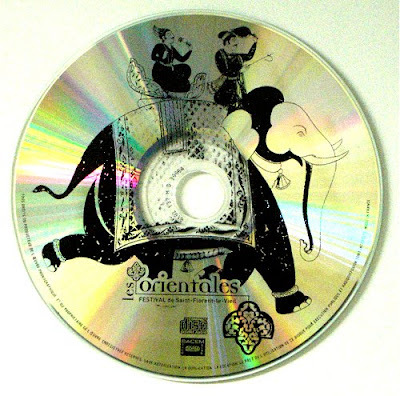 Like the Les Orientales CD, the sound quality of the MP3s is excellent. These free and legal downloads are the next best thing to being at Les Orientales. Download this absolutely essential listening by following this link to Jet FM. The top right side-bar lists five programmes from the festival. Clicking on these opens a new page, the MP3s are at the bottom of each page. The highlight of our visit to Les Orientales was the concert of improvisations by Moroccan oud viruoso Driss el Maloumi and Indian slide-guitar master Pandit Debashish Bhattacharya. Their concert is not among the Jet FM downloads, presumably for contractual reasons. But their music can be sampled on commercial CDs. 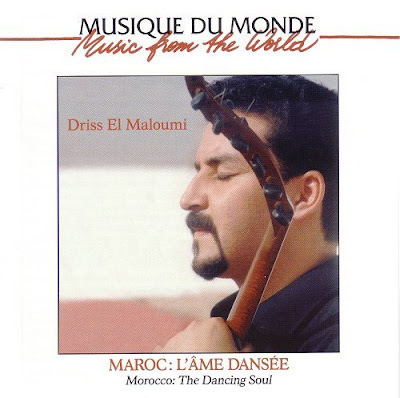 L'âme Dansée (The Dancing Soul) is a suite of original music by Driss el Maloumi based on traditional Moroccan themes. He is partnered by Lahoucine Baquir on percussion in a recording made in Agadir, Morocco by the Buda Musique world music label. I paid 17 euros for L'âme Dansée at the excellent CD stall in the festival's Eastern market. By a strange coincidence I had bought the CD below by Pandit Debashish Bhattacharya in France last year. The fretless slide guitar (or bottle-neck guitar), which is ideally suited to Indian micro-tonal music, was imported into the sub-continent from Hawaii in the 1920s, and was later enhanced by adding resonating and drone strings. 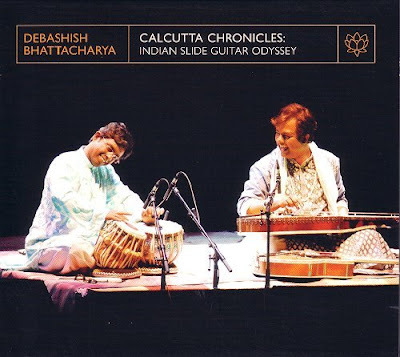 In Calcutta Chronicles Pandit Debashish Bhattacharya plays the slide guitar in ragas inspired by sources including gypsy, Indian Sufi and Bengali music. The CD, which was recorded in Kolkata, India, is on Riverboat Records, I paid 20.06 euros in Espace Mediastore in La Roche-sur-Yonne last year, but it can now be downloaded from the Riverboat website for £8.99. Pandit Debashish Bhattacharya was accompanied at Les Orientales by Prahbou Edouart on tabla. 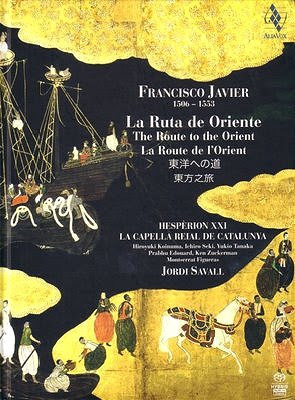 When I first heard Jordi Savall's Francisco Javier project last year I thought that the 10 minute raga inspired by the Marian hymn O Gloriosa Domina was some of the most sublime music making I had heard for a long time. Ken Zuckerman played the sarod on that track and Prahbou Edouart played tabla. Lots of paths cross on that Jordi Savall project, with Driss el Maloumi and Lahoucine Baquir among the other guest musicians. The sleeve of Francisco Javier is below, and you can read my post about it here.